Arguably the world’s largest known man eating fish, the great white shark, will take to dry land this Saturday swimming high over this year’s 35th occasional Doo Dah Parade. Equipped with a wireless camera the 5 foot inflatable remote controlled shark will, for the first time, live stream aerial footage of the parade. Now in its fifth year, doodahlive.com, working with event organizers Patricia Hurley and Tom Coston, the Pasadena Community Network and the Mountain Views News, has been able to catch all the zany, wacky fun that is Doo Dah — known as the twisted sister of the conventional Rose Parade– in real-time as it happens. 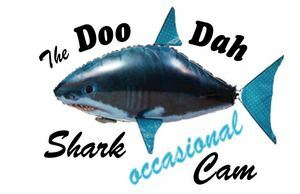 The Doo Dah Shark Cam will use the “Air Swimmers” remote controlled, helium filled, balloon shaped shark. The balloon is made from a printed “ultra-durable nylon” that is thicker and more damage-resistant than normal party balloons. More information about Air Swimmers can be found at x-zylo.com. The shark will be equipped with a mini wireless color camera about the size of a postage stamp. The camera uses a 2.450 GHz output. The shark will be capable of reaching a height of 40 feet, although it is not anticipated to go over 15 feet. The balloon will also be tethered to assure it does not fly away.